1.) You could only merge on dimensions, not on variables. 2.) The data format between the two data sets had to match – for example, February 7 2019 would not merge with a 2/7/2019 and Joe Smith would not merge with JOE SMITH. Now we have the ability to modify the format of an existing dimension so that we can then merge the resulting data with data from another data provider. This article will explain that process. We have two dimensions which we can use for merging in these data sets – Year and Quarter. Since they are both Numbers, there will not be any issues with merging these dimensions. 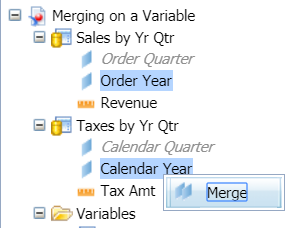 After selecting Order Year and Calendar Year with your control key, right click and select “Merge” to merge these dimensions. 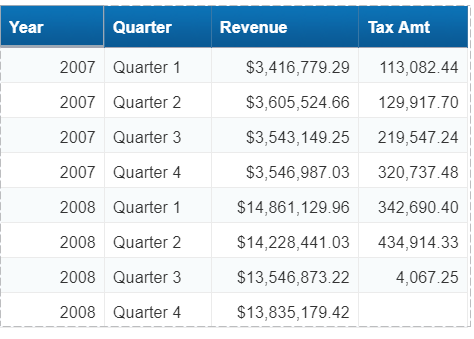 Notice how the values for Tax Amt are repeating for each quarter and are showing the year total amount on each line. This is because there is no way for this data to display properly, because there is not a correlating merged object for the Tax Amt to know how to display. In SQL terms, it means there is a join missing. 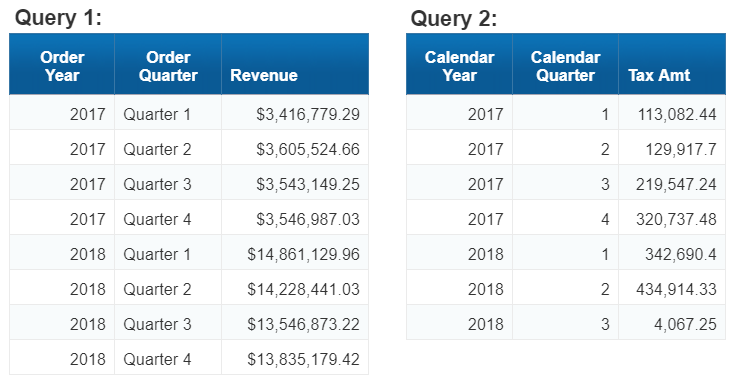 To help the two data sets know how to display together, we have to merge the Quarter dimensions. 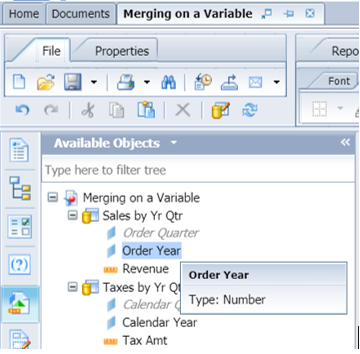 However, the data type for Order Quarter is Text … which will not merge with the data in Calendar Quarter, which is a Number. We can overcome this limitation by creating a variable so that the data in both sets will match. 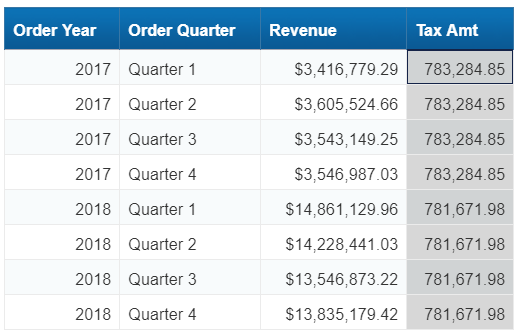 Name the formula as “Tax Qtr” to complete the variable. By appending text in front of the number, the new variable will have the data type of Text, which is just what we want. Now we are ready to merge Order Quarter and Tax Qtr. Select both objects using the control key, right click and select Merge. Note: By default, Web Intelligence will name the Merged dimension by the same name as the first selected dimension. However, the name of the merged object can be changed easily by right clicking on the merged dimension and giving it a new name. I recommend using a different name to help clarify that the table is using the merged object rather than the universe/query object. Having the ability to create a variable and reformat how data is displayed is a great help when needing to merge similar data with different data types. May this tidbit help with your future data analysis by bringing data sources together using the Merge function with variables. 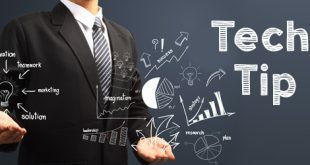 Want more tips on Web Intelligence? Join the Let’s Speak BO Webinar series and gain access to a library with over 30 webinars on Webi.